Giovanni said: "I live in Florence and would definitely recommend the Paperback exchange. It deals with new and used English books. It’s been going on for at least thirty years and the staff are really helpful and friendly." 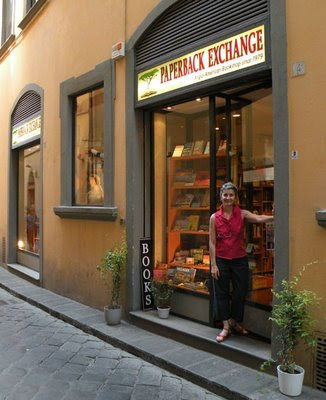 Paperback Exchange, a lovely and more importantly, independent Florentine bookstore, embarked on its long voyage in 1979, full three decades ago. First it was primarily a second-hand bookstore, which started building its stock thanks to people who brought in English titles from their homes. A small family business has blossomed into an internationally recognized bookstore selling both new and old, a place were solely books in English reside. 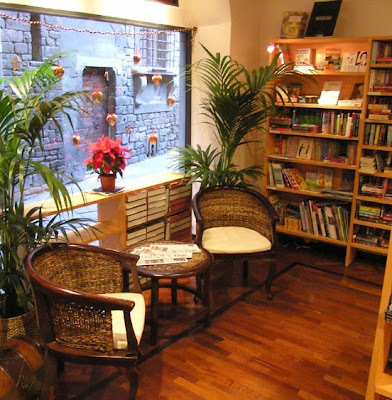 The bookstore has changed its location in 2005 after the move to the centrally located Via delle Oche, very near the Duomo. This new address, backed by the long tradition of the bookstore, has quickly become a popular meeting point for the English speaking community of Florence. Paperback Exchange is still in possession of their original owners: Emily Rosner and Maurizio Panichi. Paperback Exchange stocks thousands of both new and second-hand titles (and remains very active in exchanging second hand books), both paperback and hardback (despite the bookstore's name). The new and the second hand titles are mixed and the whole stock is divided into sections focused on specific subject areas. The stock is very extensive but it's still possible to point out some of its aspects which stand out - the Italian interest section, books on art, as well as original textbooks and academic titles published in the UK or the US. In fact, with their vast selection of academic titles, the bookstore is also a very important library and university supplier. Paperback Exchange also organizes various events such as poetry readings, discussions and even the children's story hour. They pride themselves in managing to persevere in this competitive market and personal attention, speed, efficiency and transparency, which are their defining values, have helped them along the way. I went to the Paperback Exchange several times while i was living in Florence last Oct. Since they buy back old books, I was able to unload the ones i finished and didn't feel bad about buying new ones. They've got great prices on used books too! This is probably the bookstore which has the greatest selection of English books in Florence. It has lots of new books and a great selection in philosophy and history, as well as poetry.